In Arthur Miller's classic play about the Salem witch trials, unseen and unseeable evil stalks the town, threatening to destroy the lives of the God-fearing colonists. A clique of young girls are the only ones capable of unmasking the terror allegedly caused by hidden witches and devil's consorts. The girls uncover ugly truths, settle old scores and leave behind a trail of destruction. 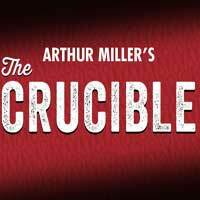 Since its premiere in 1953, a masterful allegory for the rise of McCarthyism in the late 1940s, The Crucible has become an American classic. Experience the timeless and poignant tale at Olney Theatre Center's mainstage. "..."The Crucible" is one of America's great protest plays, and Eleanor Holdridge is letting it roar. There is nothing timid about the performance, from the big, ­abstract set suggesting blazing woods to the epic-scaled, ­edge-of-hysteria acting." "...Miller was writing for his own time, which makes the prescience of some of the lines more surprising. A minister states confidently that "evil can never overcome a minister"; the court tells a witness, "The pure in heart need no lawyers"; a member of the court refers to the need to "touch the bottom of this swamp"—all phrases that have taken on meanings unknown in 1953." "...Craig MacDonald captures both the comedy and pathos of John’s old friend, Giles Corey. In brief first scene roles, Yakima Rich brings a light comic touch to Susanna Walcott, one of Abigail’s confederates, and Lillian Oben is spectacular as Tituba, the Barbados slave who is bullied into admitting witchcraft and naming others. It would have been lovely to see more of her in the women’s prison scene, which was also cut." "...“The Crucible” is by no means a feel-good play. It’s serious to the core with a few clever chuckles sprinkled among the dialogue. Though not entirely historically accurate as far as individual characters’ ages and other details are concerned, it still presents a grim portrait of this shameful period in history and alarmingly shows that human foibles of that era exist even today." "...But this large and complex production of a large and complex story is graced by many fine performances, two most notably. Elizabeth Proctor and John Hale are the two characters who change the most in this, and Zampelli and Parkinson are marvelous. Consider Zampelli's task, in her first scene: Elizabeth Proctor is furious about John's adultery, but she is ashamed of that fury, because she knows that Christ requires them to forgive the transgressions of others, and so she tries to put on a good and welcoming spirit, but she cannot, because of her fury. Thus Zampelli has an entire narrative arc which she must discharge the first moment she opens her mouth. She does so, beautifully."